Five Students from Advertising and Graphic Design were selected among the finalists in the 2016 ADCC Student Competition. Winners will be announced at the Directions 2016 Awards Show on November 17, 2016 in Toronto. All details are available on the website of The Advertising & Design Club of Canada. Stephanie Hier (BFA, 2014) and Keita Morimoto (BFA, 2012) are among 15 finalists in the prestigious RBC Canadian Painting Competition. Held in collaboration with Canadian Art Foundation, the 18th edition of the competition drew a total of 568 submissions. It is the cornerstone of the RBC Emerging Artists Project which focuses on supporting early-career artists. The program offers mentorship and exposure to a variety of audiences in addition to financial support. The winner of the competition will be awarded a cash prize of $25,000. Two honourable mentions will receive $15,000, and the remaining 12 finalists receive $2,500 each. 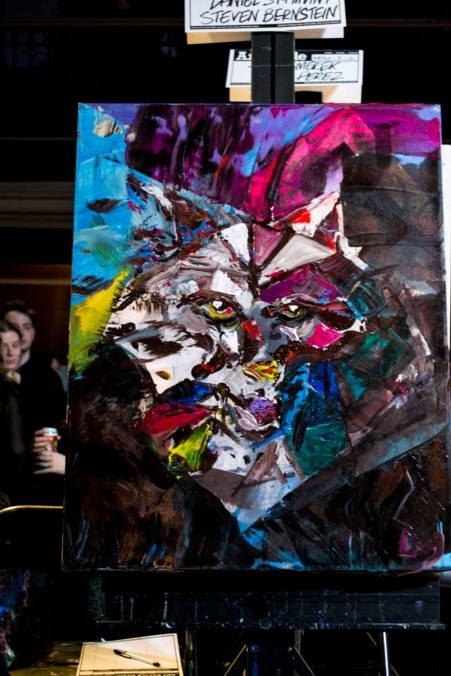 The top three paintings will be acquired by RBC’s corporate art collection. The winner will be announced on September 20 at the Power Plant in Toronto. 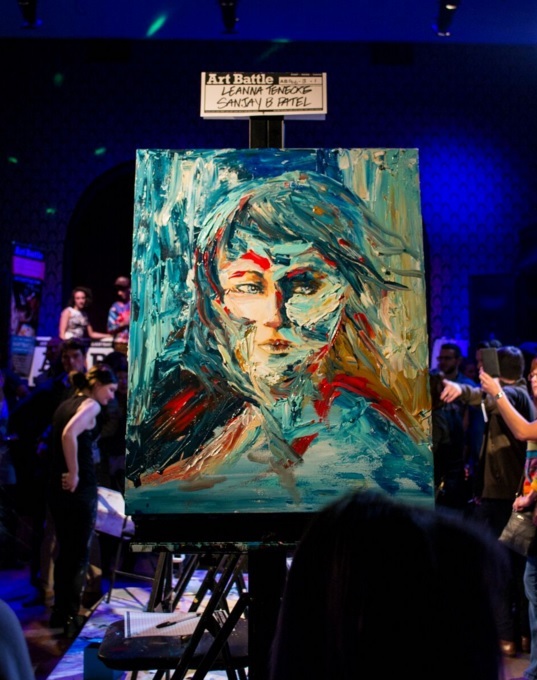 To see the complete list of finalists visit canadianart.ca. The announcement of the 2016 winners will be held at the OCE Discovery conference at the MTCC in Toronto on May 10 from 3pm-4pm. If you are interested in attending the event, and have not already done so, please RSVP to Alex Hughes (ahughes@cou.on.ca) or reply to this email by Friday, April 29, 2016. Alex is also available to answer any questions that you might have regarding the 2016 IDeA competition or the announcement of the finalists. Virginia Gail Smith, a third year student in OCAD University’s Sculpture/Installation (SCIN) program, is the winner of the 2016 First Capital Realty Public Art Competition. Smith’s sculpture, Urban Forest, combines casts aluminum and quarried stone and will be installed in Oakville, Ontario. Responding to ideas of sustainability and environmental stewardship, Smith’s project creates a space for conversation and relaxation for The Shops of Oakville South shopping centre. Thirteen proposals were received from students in the Faculty of Art, the Faculty of Design, and the Faculty of Graduate Studies, as well as submissions from recent OCAD U graduates. All of the shortlisted submissions will be on display in the Ada Slaight Gallery for the duration of OCAD U’s 101st Annual Graduate Exhibition (May 4 to 8, 2016). First Capital Realty, Canada’s leading owner, developer and operator of supermarket- and drugstore-anchored neighbourhood and community shopping centres, has made a substantial commitment to sponsoring this public sculpture competition which is open to third- and fourth-year OCAD U students as well as recent graduates. As this year’s winner, Smith will receive a $5000 prize and First Capital Realty will cover the cost of fabrication, site preparation, transportation and installation of her sculpture. In addition, each of the shortlisted finalists will be awarded $350 for the production of a model, plus assistance from an OCAD U digital technician to create a professional 3D rendering of their models in situ for presentation. This year’s competition was coordinated by Derek Sullivan, Assistant Professor (tenure-track) in the Sculpture/Installation program at OCAD U. Winners of the competition will be announced Tuesday, May 10, 2016 at the OCE Discovery Conference ‘16. Mary Baumstark, graduate student in the Contemporary Art, Design and New Media Art Histories program will join twenty doctoral and master’s degree students from across Ontario to present his/her research at the provincial finals of the Three-Minute Thesis Competition (3MT Ontario) on April 14 in Waterloo. The 3MT is a communications competition for graduate students. Developed in Australia by the University of Queensland in 2008, the 3MT challenges students to explain their research in plain language in just three minutes. This is not an easy task considering a full graduate thesis can be 80,000 words in length. The 20 competitors in the provincial competition are all winners of local competitions hosted by every university in Ontario. The judges will select winners of the 3MT Ontario, who will receive $2,000 in total prize money. As well, the top five presenters will move onto the national level, an online competition coordinated by the Canadian Association of Graduate Schools. The 3MT is hosted by Wilfrid Laurier University and is open to the public. More information can be found at wlu.ca/3MT. 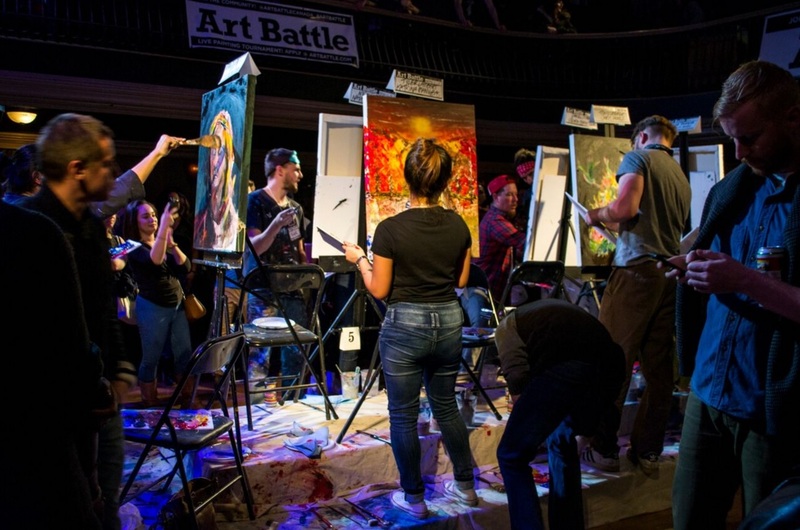 Art Battle is a global live painting competition that pits a group of artists against each other to see who can produce the best painting within the allotted time. 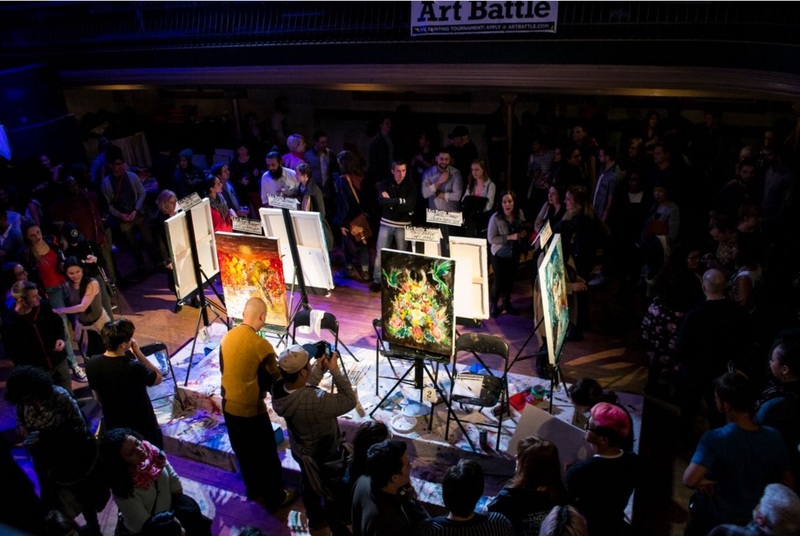 In 2009, Art Battle arrived in Toronto and held its first competition in The Great Hall (1087 Queen St. W). 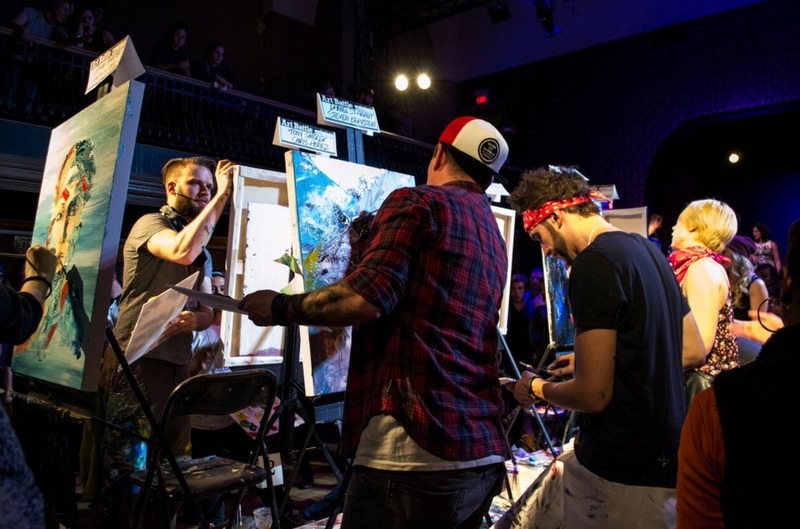 Today, The Great Hall hosts a monthly Art Battle with world-class artists. 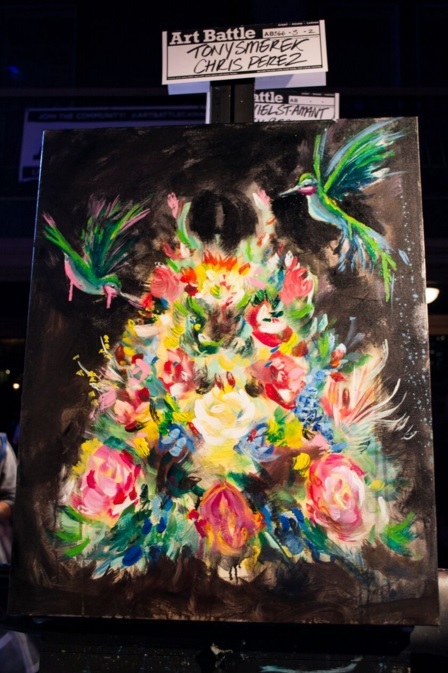 I checked out a recent Art Battle to show you what these exciting events are all about. The event begins with all spectators receiving a ballot slip. 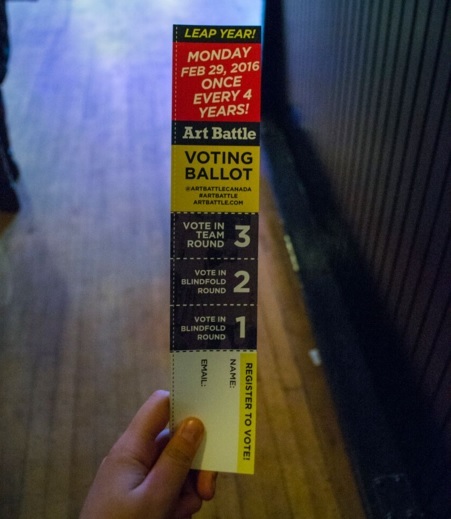 This is because the audience decides the winner of an Art Battle. Whoever gets the most votes after a round is declared the winner. The setup involves an ensemble of canvases side-by-side in the middle of the floor. 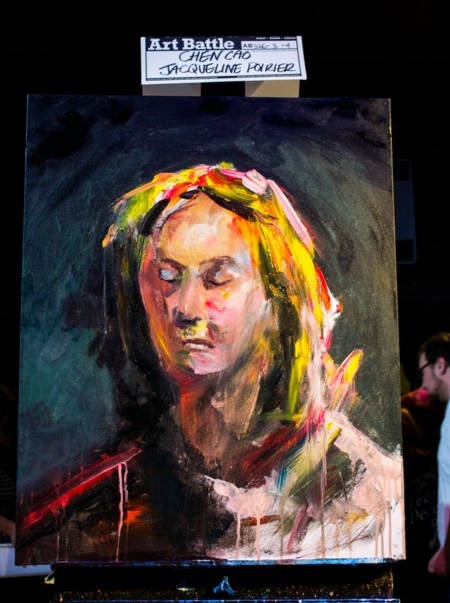 This allows the audience to rotate around and look over the shoulders of artists as they’re painting. 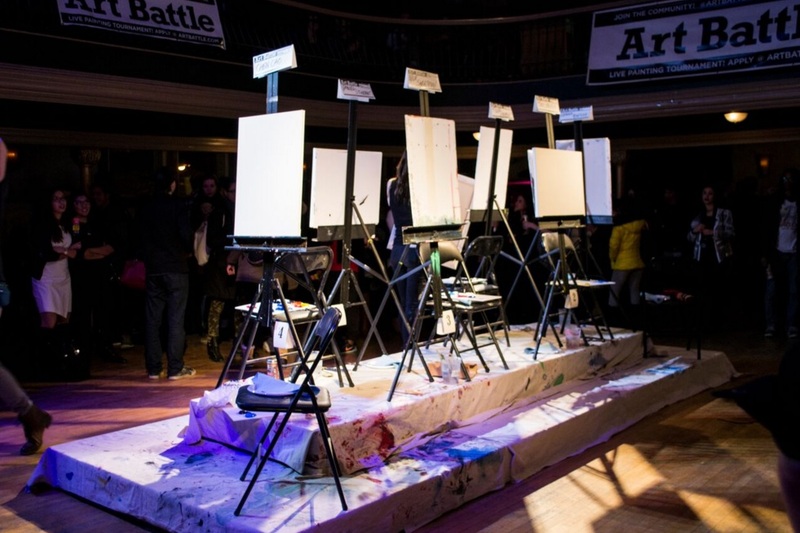 Art Battles are usually 20-minute rounds with one painter per canvas. However, sometimes there’s a spin. 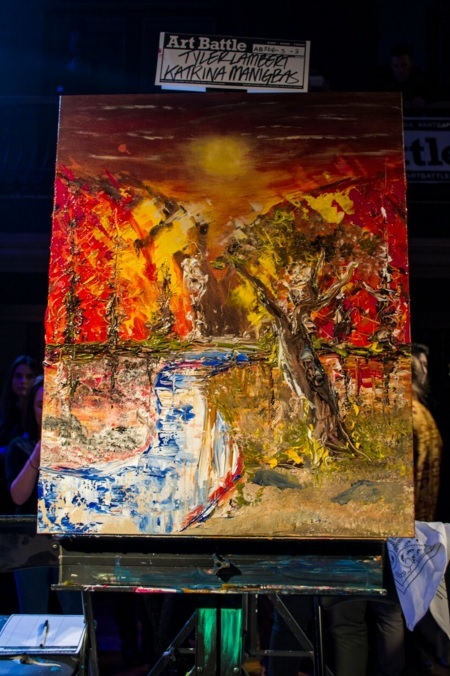 These rounds allow teams of two painters to combine visions for a total of 30 minutes. 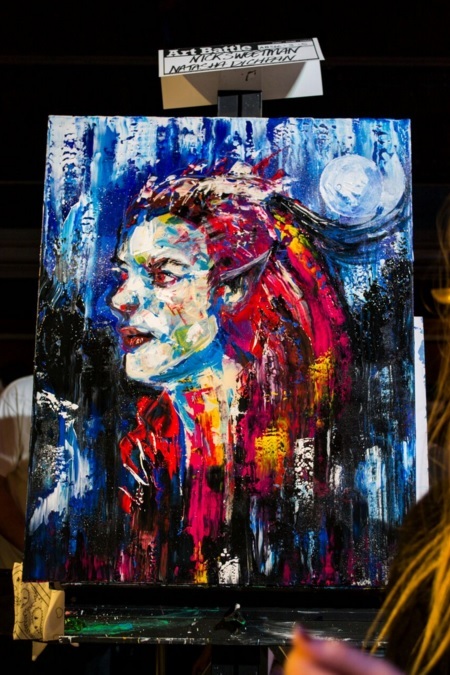 All the artists are given access to the same brushes and acrylic paint. No extra tools are allowed, and colours have to be mixed on-the-go. 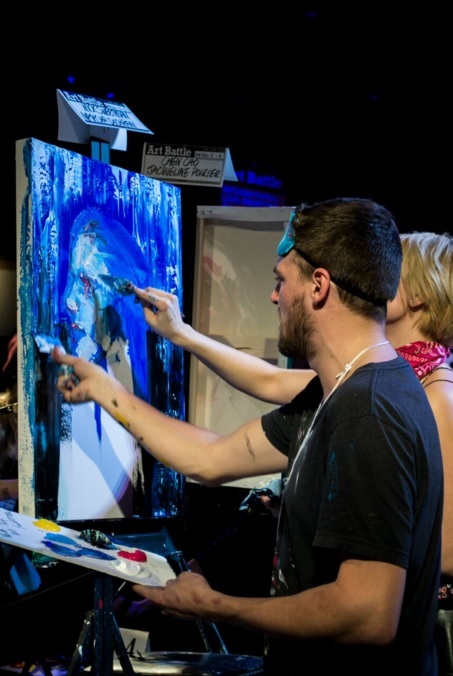 The variety of artistic styles at Art Battle range from hyperrealism to highly abstract, so you’re bound to like something no matter your taste. 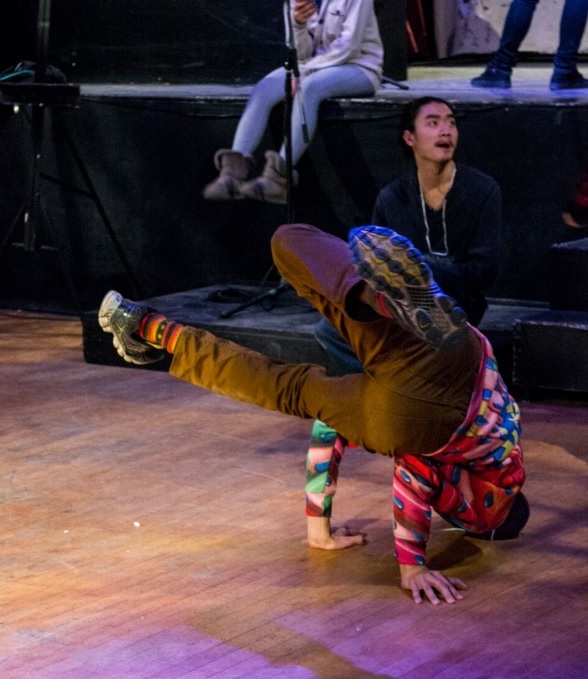 Artists grab a beer and show off their other talents, such as breakdancing, to kill time while the crowd casts their votes. The winner is announced. Congratulations to Leanna TenEycke and Sanjay B. Patel! Two teams from OCAD University’s Strategic Foresight and Innovation Program will soon travel to regional rounds of competition for the $1 million Hult Prize. The prize awards the best social enterprise that can double ten million people’s income by the year 2020. Team members in the Jade Initiative, Courtney Cooper, Vincent Galante, Ziyan Hossain and Lisa Hart, are heading to Shanghai to pitch their idea to leverage the value of trash to create meaningful jobs and clean cities in the developing world. The city of Dhaka, Bangladesh, for example, has 100,000 people who make their living as waste-pickers. The Jade Initiative would take these people out of the dump and create franchise opportunities and networks for entrepreneurs around recycling collection, on-demand junk removal and waste aggregation services. OCAD U’s second group, Team Zero, is travelling to the regional competition in Boston. Calla Lee, Melissa Tullio and Christine McGlade will be pitching their idea to manage food waste. The idea would employ women in developing countries to collect food waste from restaurants, compost it and then sell it to urban farmers as fertilizer. Most megacities in developing countries don’t have any municipal compost collection. The Hult Prize regional competitions are happening March 11 and 12. The Queens Start-up Summit is a University wide weekend long competition. Each year delegates are accepted from all over the province as designers, developers and general delegates. The aim is to create a start-up pitch ready for market within the weekend. It is an annual initiative founded by the Queen’s Innovation Connector that supports the advancement of student entrepreneurship, providing an opportunity for students to collaborate, compete, and realize their potential. This year OCAD University students were found in each winning team, claiming First prize of $5000.00 for ‘Spaces’. With different disciplines collaborating with their specific expertise, it is an important experience to diversify skills as well as an wonderful opportunity to have ideas funded. Open to all students and first and second year alumni. We're looking for teams of students to design and build an interactive installation/spectacle onsite at the WayHome Music & Arts festival.